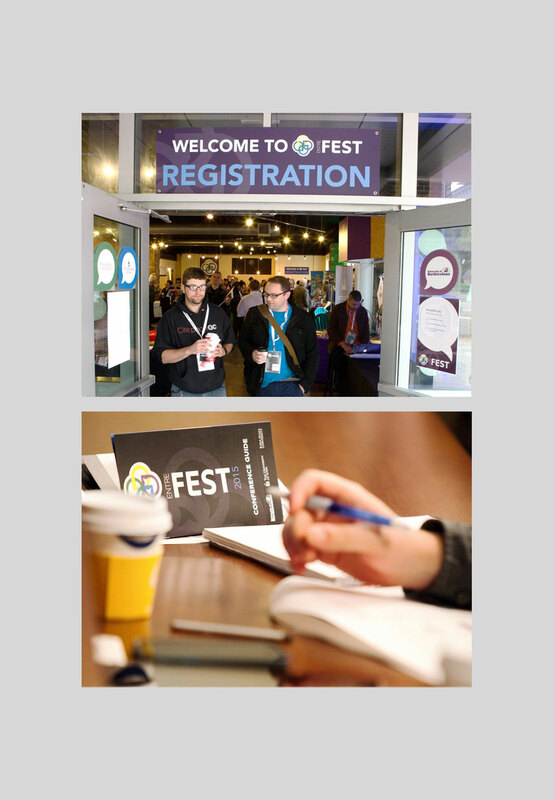 EntreFEST, Iowa’s entrepreneur and innovation conference, is designed to be part summit, part resource hub, and part festival. After seven years, a new focus emerged to grow the conference. Seed Here Studios engaged Creative Mellen to refresh the brand to reflect the conference’s expanded mission as well as today’s Iowa entrepreneurs. EntreFEST’s mission is to bring entrepreneurs together from across Iowa to share ideas, learn from national speakers, participate in workshops, and have fun. As EntreFEST grew, it encompassed a wide variety of businesses, providing an opportunity for participants to learn from other industries. With this convergence in mind, we designed a dynamic logo to illustrate a networking event intertwined with education and the exchange of ideas. Individual elements of a map pin and voice bubble were joined to show a network of learning. Each color can represent different tracts throughout the festival and provide a quick, visual reference for locations where specific tract events are held. Emphasizing FEST within the name allowed the brand to be more encompassing of a festival than just a conference. Within the new identity, we incorporated supporting brand elements throughout multiple areas of the festival, including registration materials, lanyards, event brochures, stage graphics, posters, and supporting digital graphics.